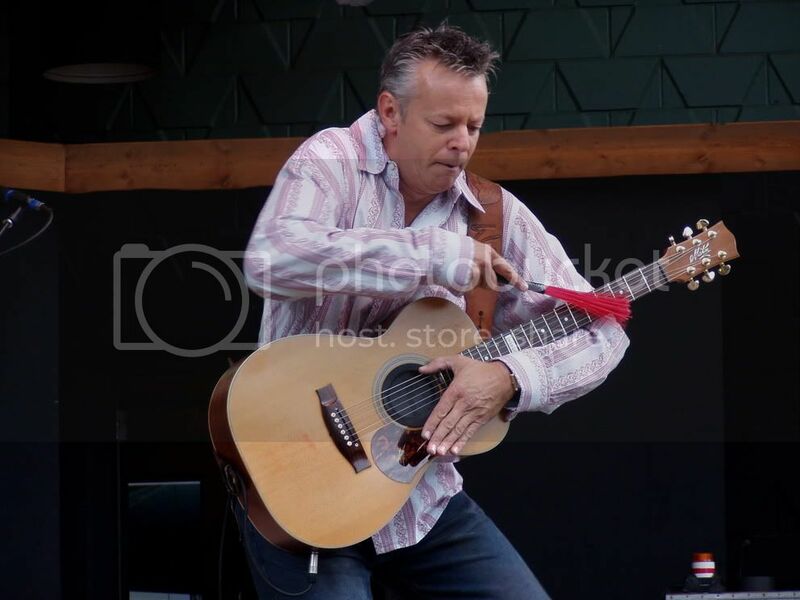 This is Tommy Emmanuel. Playing drums. On his guitar. Mike, my dad and I went to see Tommy last night at BB King's. I hate BB King's. If you want a good seat, you need to get there three hours beforehand, and you have to buy dinner. As Mike put it, they go out of their way to make sure your experience is wholly unpleasant. But Tommy doesn't play NY often, and this was the only place to see him. So off we went. I first heard about Tommy from my dad, of all people. He saw him on Sierra Center Stage on one of our local PBS channels, and called me immediately. I caught him doing some of the percussion above, as well as other blues, jazz and acoustic rock tunes. I was mesmerized. The minute I found out he was doing a NY gig, I knew I had to go. There are very few words to describe what we saw. A master of fingerpicking, a beautiful instrumentalist, and an amazing showman with absolutely no pretention. He has a style all his own, acts like a complete goofball on stage, and welcomes everybody with open arms. If he ever plays in your area, whether you're a guitarist or not, if you just enjoy good, fun instrumental music, SEE HIM. EDIT: You can also listen/watch him in the Woodsongs Archive (top right corner). Tommy's tour dates: he's playing everywhere but NYC, pretty much. AND A STEAL: Purchase "The Great Tommy Emmanuel" 3-CD set on Amazon for $18.99 - my dad paid $40 for this last night!